GWR features the finest "Micro Grain" C3 Carbide cutting bits for all brands of brake lathes, while the industry standard is only C2 Carbide. We additionally offer the newest of cutting technologies like "Round Bits" and our revolutionary "Super Purple PVD Bits". These special bit designs speed up the cutting process by up to 70%, while reducing rotor roughness (RA) by up to 25% and net cost per rotor by up to 50%. By purchasing your carbide lathe bits and service items from GWR, you can save 25% to over 60% on factory replacement and OE quality aftermarket parts for your shop. Please visit the bit or supplies pages via the links at the bottom of this page or e-mail us at sales@GWRauto.com with your needs or order. If you want more specific information or you would like to speak directly to a knowledgeable sales representative before ordering, please call 1 (800) 266-4497 weekdays between 1PM and 8PM (EST). We honestly value our customers and will spend all the time necessary to make sure you get the right items and best prices for your lathe supplies... that's our promise to you. Cut Rotors Five Times Faster! GWR offers the original from 1992, the first and highest quality Round Bit rotor finishing system in the industry. Because of the exclusive "lock washer" hold down clamp, there is no equal on the market! A simple tightening of the screw on the proprietary clamp prevents the bit from turning or chattering, unlike the other versions being sold through most parts distributors. The secret is to look at the screw. If it is 90º (vertical orientation) to the tool holder body... it is the proper design and will work properly. Unfortunately some OE companies have recently tried copying this unique design and are causing confusion in the market place. It's interesting to note that 10 years ago Ammco said "round bits are bad and would not work". Now they are saying "theirs are just like the ones GWR sell". Just be careful with the copies! Our holders work and have the exact design that assures you the finest finishes, easiest changes and longest life. There is no equal in automotive triangle bits, this quality is normally only sold to the machine tool industry! First, our bit is positive rake! This allows for a finer finish cut when compared to negative rake designs. Additionally, they will shave through hard spots, not bump over them. This produces truer rotors, with less possibility of run out. Second, our bit is larger than the most common brands of lathe bits like Ammco, Hunter, Snap-On, etc., it has a 3/8" I.C. 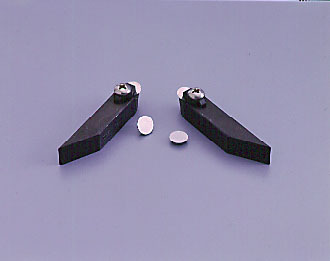 vs 1/4" I.C (Inscribed Circle diameter). The larger the bits I.C., the better they cut on all fronts and the longer they last because there is less wear on an individual point of contact. Third, the normally sharp points (like most triangle bits) are rounded to an extreme degree. This creates a unique slicing or pealing action of the rotor metal, not the ripping or tearing action common to a standard sharp point design. An additional benefit is you can index the bit, move it to the opposite tool holder after three turns, to increase the number of cutting positions to six. Fourth, but probably most important, we use the finest grade of carbide and then process it through several heat treatment processes, including a final P.V.D. coating to enhance edge sharpness. This process is far superior to all other processes, including titanium coatings. Unconditionally guaranteed, these are the finest bits money can buy! Plus you pay no more because they double the number of cuts per bit, when you index them. they cost you less to use than standard bits! 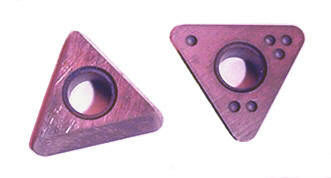 Notice the layering effect that is clearly visible on the surfaces of our carbide lathe bits. Also notice the roughness of the actual carbide below our coating, this would be your cutting surface if you aren't using GWR's PVD coated bits.